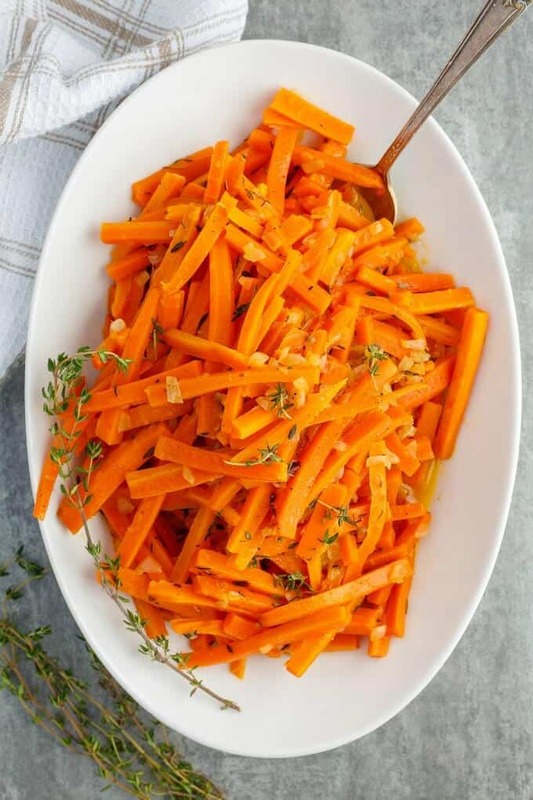 Free up the oven and stove this holiday season with these slow cooker lemon thyme butter carrots! Vegetarian and gluten-free, they are bound to win over the pickiest of eaters! The photos and recipe for these slow cooker lemon thyme butter carrots have been updated as of November 19th, 2017! During our holidays, you always find some sort of carrot dish on the table. They are essential! I prefer a tender-crisp carrot dish, and today’s recipe definitely has that going for it. Which can be a bit surprising since the recipe is made entirely in the slow cooker. Yes, that’s right, the slow cooker! 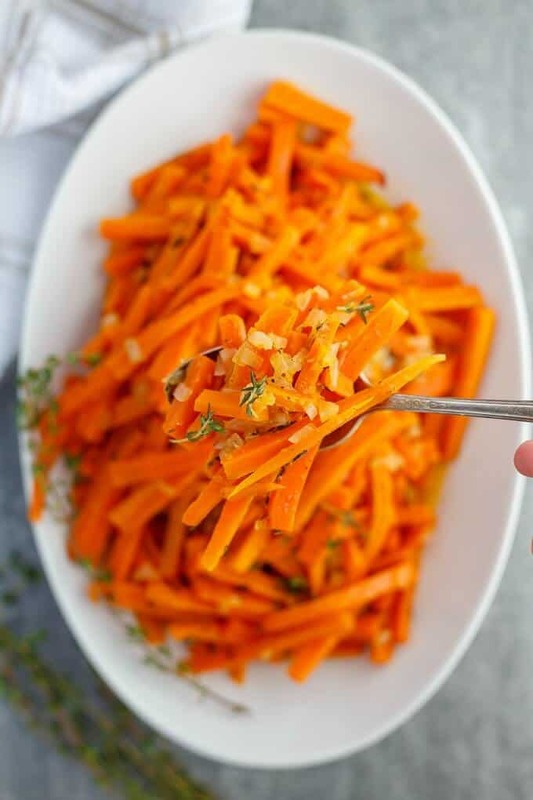 These slow cooker lemon thyme butter carrots are really easy to make, and reward you with a ton of flavour! 3 hours on high heat is all it takes, and the carrots come out with that perfect texture and consistency. Because let’s be honest, no one wants soggy, mushy carrots. As I have said many times, thyme is my favourite herb. And does it ever work perfectly with lemon and carrots! 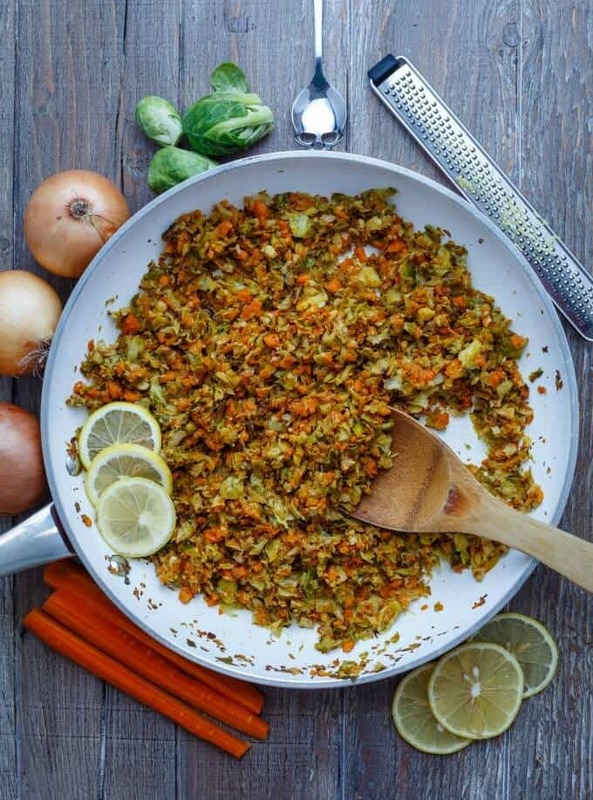 I find carrot recipes always taste better the next day, so if you want to prepare yourself even more for the holidays, make the recipe a day in advance! I like a bit of tartness to any of my lemon dishes, so I only added 1 tsp. of sugar. 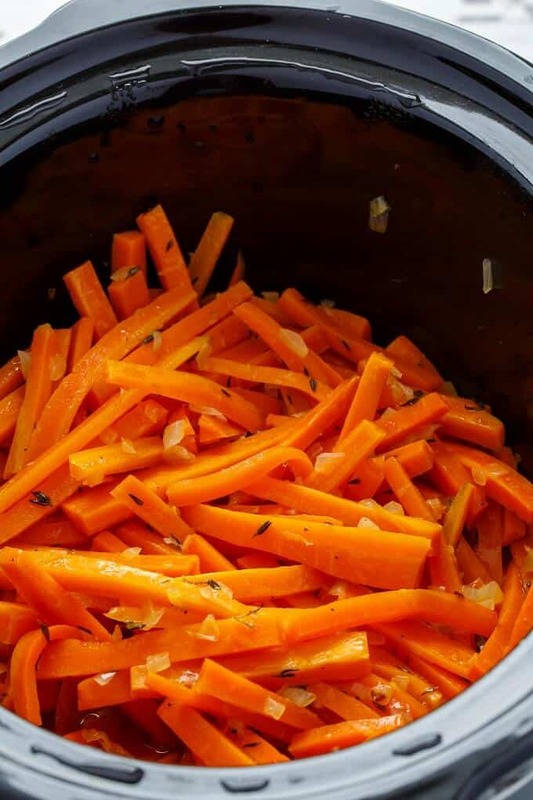 However, taste as you go, and if needed, add more sugar to these slow cooker lemon thyme butter carrots. Also, if you have a family member like my dad who hates onions, you can easily omit them! UPDATE: The more I make these carrots, the more I prefer them without sugar! So now I just omit that ingredient altogether! Free up the oven and stove this holiday season by using the slow cooker! Add carrots and onions to a 6-quart slow cooker (4-quart works, too! Just stir a bit more often.) Combine butter, thyme, zest, and lemon juice in a small bowl until thoroughly combined. Pour over carrots. Season with salt and pepper. Cook on high heat for 3 hours, stirring halfway through. 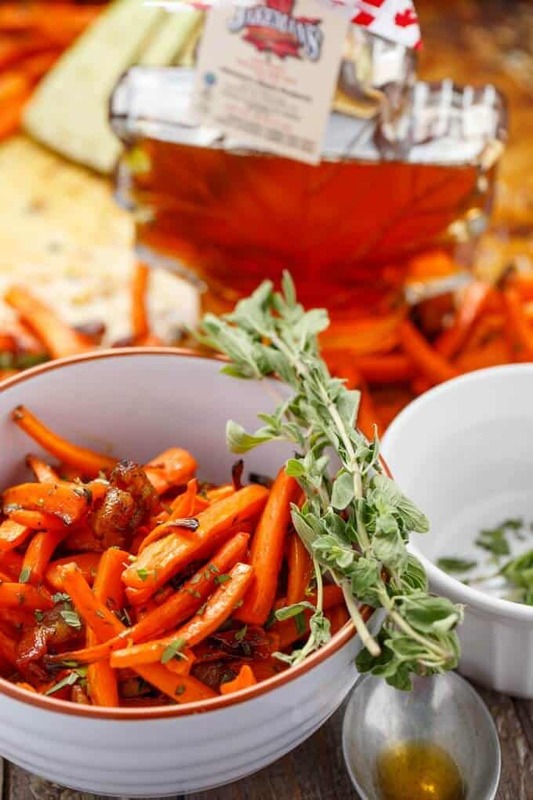 Garnish with additional thyme if desired and serve! These look delicious! Just curious, if you make them the day before, what method do you use to reheat them without then over-cooking them and losing that crispness? If I double this recipe, do you think it will all fit in my 6 quart crock pot? Since a 4 quart would work as written, seems there may be room *crosses fingers* Trying to feed a crowd. Oh, I think so! I have made this recipe in a 6-quart and there was ample room. It may need a bit more cook-time and you may want to toss a bit more in the beginning so all the carrots are evenly coated :) Even if you have to remove a few carrots because it is too packed, it won't change the flavours enough to justify changing the ratios of the sauce. Do you think I could cook on low for 6 hours? Or would everything turn to mush? Thanks! I think they should be okay! You could always cut them a bit bigger just to make sure they do not turn to mush.